Extract from Sir William Young's 'Almanac for the Island of Tobago in the year 1810.' Young was Governor of the island from 1809 until his death in 1815. 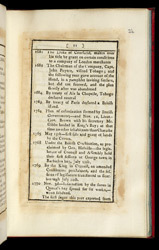 Here he has included a chronology of important historical dates and events that occurred in Tobago from 1496 until 1807. Some examples are listed below, ?1496 Tobago discovered by Columbus 1580 British Navigators planted the British flag? 1648 In two large ships, Courlanders arrive and settle on the north coast of Tobago? 1763 By Treaty of Paris declared a British island? 1770 Nov 3rd Insurrection by the slaves in Queen's Bay spread for six weeks when subdued 1784 Count Arthur Dillon appointed Governor ?